The Sydney Morning Herald: #Radioactive art tackles fall-out for Japan"
Creators wanted "to bring to the viewer the fear of the unknown". KEN and Julia Yonetani are adamant their radioactive artworks are safe. They even had scientists from the Australian Nuclear Science and Technology Organisation measure the amount of radiation produced by the works in What the Birds Knew. Yet it's hard not to feel apprehensive in the presence of installations that glow brightly because of the uranium glass beads used in their creation. The couple, who have previously created artworks with salt and sugar, used 50,000 uranium glass beads in USA, a two-metre-wide chandelier that illuminates the ground floor of the 4A Centre for Contemporary Asian Art in Haymarket. It is the largest of the 30 chandeliers they will create to represent the nuclear-powered nations of the world. 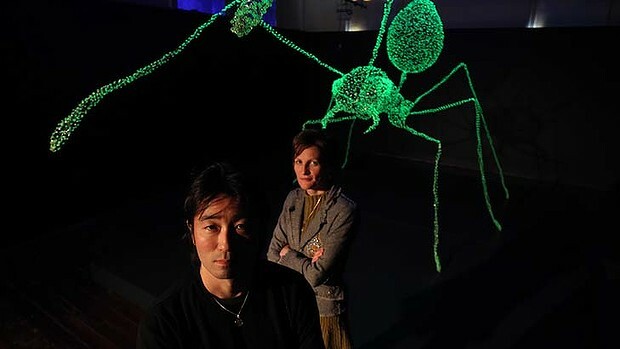 Upstairs, a six-metre ant made of 10,000 beads stands opposite glowing warning signs that read ''meltdown'' and ''radioactive''. The uranium glass came from a US company and wasn't difficult to import into Australia nor dangerous to use. Uranium glass is not sufficiently radioactive to pose a health hazard to viewers either, the Yonetanis say. It was widely used in the late 19th-century to make decorative objects such as sugar bowls, cake stands and drinking glasses. The installations might emit less radiation than a smoke detector or mammogram but they are designed to convey the fear of contamination that Japan has been living with since last year's Fukushima nuclear disaster. ''We were trying to bring to the viewer the fear of the unknown,'' Julia says. Fear of the unknown? So make it known by telling us what the air dose level is in microsievert/hour right beneath the 50,000-bead chandelier. Then we'll decide if it's "safe". (UPDATE) Of course. The air dose rate would be background, as uranium emits alpha. Thank you readers. I still don't want to be near the chandelier, much as I don't want to be near those bricks made of uranium mining debris which are still used at the government ministry buildings. I don't remember seeing any news about it last year, but then I didn't pay much attention to Fukushima II (Daini). TEPCO released a series of photographs showing the repair and improvement on Fukushima II Nuclear Power Plant. 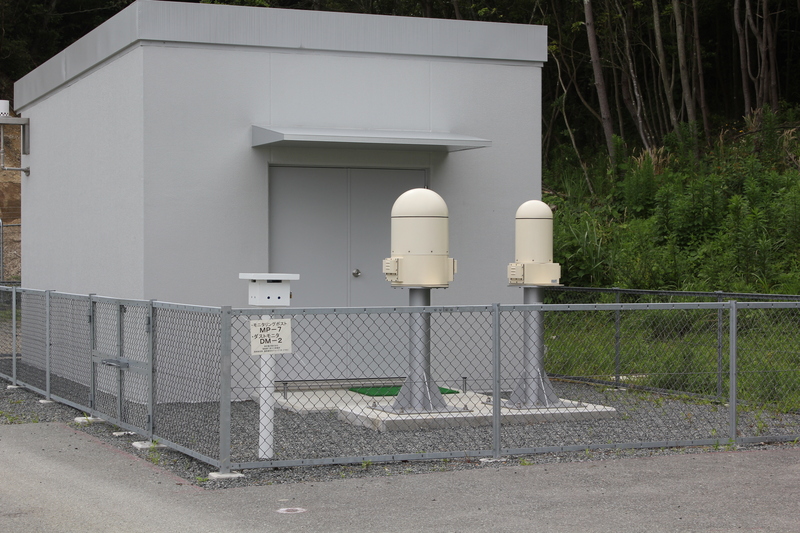 In it, there are photographs of Monitoring Posts 6 and 7, right after the earthquake/tsunami on March 11, 2011 and after they were rebuilt. Comparing this with Google Map, that's about 200 to 300 meters from the river mouth. I've written about 137 alarms at Ooi Nuclear Power Plant Reactor 4 and the jellyfish protesting the restart (again) in my previous post. Yomiuri Shinbun tells us the scale of the jellyfish attack this time. 200 cubit meters worth of jellyfish forced the plant to reduce the water intake by 30%. KEPCO disclosed on August 2 that the output was lowered for Reactors 3 and 4 at Ooi Nuclear Power Plant in Ooi-cho, Fukui Prefecture for 17 hours at the end of July, because of the swarm of jellyfish near the water intake that reduced the amount of cooling water collected. Output reduction in Reactor 3 was 1.8% maximum, and 1.3% maximum in Reactor 4. It is the second time since July 8 after the restart process started that the output was reduced because of jellyfish. According to KEPCO, the number of jellyfish started to increase in the afternoon of July 30, when [both reactors] were in full operation. Reactor 3 started to reduce output at 3:30PM, Reactor 4 at 4PM. Jellyfish started to decrease in numbers by the early morning of July 31, and the output was restored to full at 8:30AM. Jellyfish attached themselves to the water intake screen which was installed to remove floating debris, and the water intake capacity dropped by more than 30 percent, according to KEPCO. The volume of jellyfish removed is about 200 cubic meters. KEPCO is considering measures to deal with jellyfish. Easy. Let Senior Vice Minister Makino to scold jellyfish: "Lowly Jerryfish should never stop a modern Nuclear Power Plant! Be gone!" Otherwise, I think the best countermeasures against jellyfish is to stop the reactors so that no warm water is being released into the ocean from the plant. Great. Just great. After 17 months since the accident, not only we're not getting any wiser, but we are actually getting dumber by the day if not by the hour. And it is not just the Japanese in Japan either. I already wrote about the "news" by Russia Today on July 21 which almost all Japanese understood to mean fishing had been banned in California because of radiation contamination of fish from the Fukushima I Nuke Plant accident. I tweeted in Japanese that it was not true at all. I continue to be the lone voice, and more and more people tweet this RT's "news". If the reader take a look at the RT video embedded in the post, he/she will see right away that this photo is a fabrication. The brief post at the site does not say anything about fishing ban in California. Whatever the intention of this website may have been, the two Japanese blogs (here and here) posting the link to this English post say "Bluefin tunas from Fukushima waters are contaminating the ocean there, and it's really a serious problem! ", and "Radioactivity in the ocean off the coast of California is rising rapidly! ", and they attribute their remarks to RT's "news" as they saw it on this English site. One of my Japanese followers just tweeted me saying "But it cannot be false, because Russia Today had it in the news!" Another favorite among the Japanese continues even stronger today - the "news" about the Japanese Olympic team escorted out of the Olympic stadium during the opening ceremony because IOC didn't want the radiation contamination from the players. Today, it's got juicier. All these empty seats at almost all Olympic venues because of the poor planning by the organizers and corporate purchasers of these tickets not bothering to show up have now been attributed to ... (drum roll please)... racial discrimination against the Japanese players because people are afraid of radiation contamination! Oh we're hated by everyone in the world! Poor us! 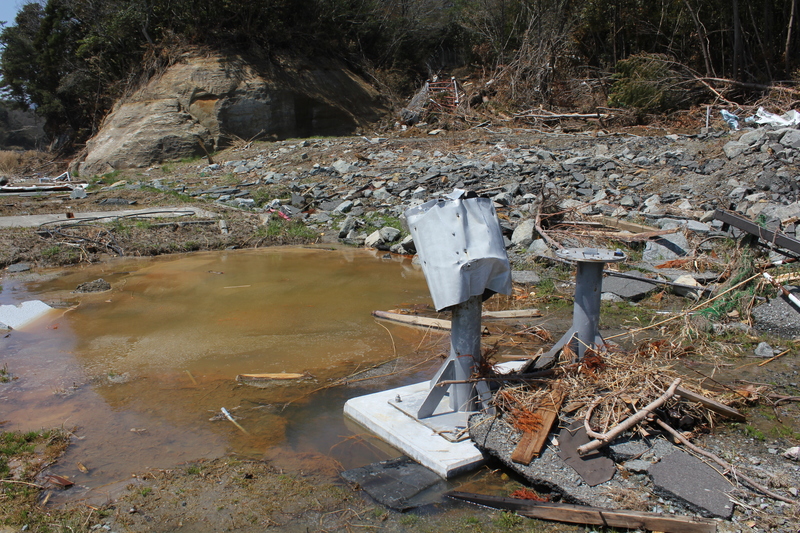 All because of the government and TEPCO! And Japanese media is not doing the job, because BBC reported it! Like I said, I give up. KEPCO seems to have much thicker skin than TEPCO, if that's even possible. KEPCO says the alarm at one of the thermocouples inside the Reactor 4 Pressure Vessel has been triggered 137 times since the reactor started the full operation on July 25, but it's not a problem, things will sort themselves out soon. KEPCO announced on August 2 that an alarm was sounded 137 times as of 3PM that day which indicated the rise in local temperature of the primary coolant [water] inside the Reactor Pressure Vessel in Reactor 4 (1.18 million kilowatts) at Ooi Nuclear Power Plant. The alarm was first sounded in the early morning on July 25, when the reactor started the full operation. The temperature of the coolant around one of the nuclear fuel assemblies (193 assemblies total) rose to the level that would trigger an alarm. According to KEPCO, the particular fuel assembly had been used once before and had relatively high fuel burnup. The company says that a change in the amount of flowing water temporarily raised the temperature of the coolant. KEPCO doesn't think there is any problem with the fuel assembly arrangement based on the fuel burnup, and says the temperature will stabilize by the middle of this month. On July 30, the power output was decreased by 1.8% as both Reactors 3 and 4 reduced the amount of seawater intake because of jellyfish. KEPCO's press release on 8/2/2012 includes their explanation (in the attachment No.3) of why the alarm is being triggered and why it is no problem, in a very technical term (again, they outdo TEPCO). From what I could figure, the thermocouple at this particular fuel assembly has been registering temperature higher than the standard (between 305 and 336 degrees Celsius), but it is because this assembly has high fuel burnup having been used once already, and as the time goes the relative output of the fuel assembly will drop, and the temperature will drop. The current cycle is the cycle No.15, and KEPCO uses more fuel assemblies that have been used once than in the previous two cycles, so the higher temperature is to be expected. As long as the temperature is below the saturation temperature (345.3 degrees Celsius), there is no problem with cooling. Ooi Nuclear Power Plant's two reactors are both pressurized-water reactors from Mitsubishi Heavy Industries. The temperatures of the coolant inside the PWR, according to wiki, is 275 degrees Celsius as the water enters the RPV at the bottom, and 315 degrees Celsius as it flows upward to the reactor core. For those of you who want to watch. No info as to whether the meeting between Prime Minister Yoshihiko Noda and the organizers is actually happening today or not. How generous of them to allow deviation from their "single issue" (i.e. "saikado hantai" - against (Ooi Nuke Plant) restart). 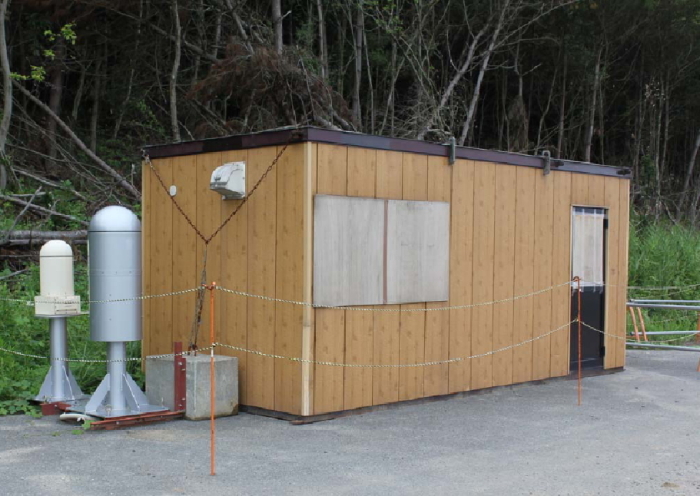 This time, because the appointment of commissioners for the Nuclear Regulatory Commission is imminent, which requires consent of the Diet, we will also appeal for the retraction of the plan that will appoint people from the "nuclear village", including Mr. Shunichi Tanaka. Please use Kasumigaseki Station, Toranomon Station and Sakuradamon Station. Kokkaigijidomae Station on Chiyoda Line and Marunouchi Line is expected to be hugely crowded. If any of you are going, please write in the comment section tomorrow. Again, I'm not too thrilled with these young and rather arrogant organizers who have been dissing anyone older than them, but I support people of all ages expressing their discontent directly to the power that be in Kasumigaseki. This group will be also protesting in front of the Ministry of Economy, Trade and Industry Annex (where NISA is housed) from 6:20PM to 8PM, against the Nuclear Regulatory Commission appointment and the restart of Ooi Nuclear Power Plant. People in Osaka City is protesting in front of KEPCO Headquarters, as usual. This has been one of the most "popular" pieces of "news" circulating furiously on Twitter in the past few days. Looking at the date of the news video uploaded onto Youtube by Russia Today (July 21, 2012), RT seems to be the source of the "news". The story is reported by RT's Madina Kochenova, according to the video description. The video has a catchy title (literally): "Fishy Catch: Fukushima fins spotted on US shores". Many Japanese people in Japan on Twitter are so distressed (or feigning distress) that the fishing is banned in California because of radiation contamination. Oh My God, look at that sign, it does say "No fishing"! OMG, what do we do when the US demands compensation? We're eating fish here in Japan, and over there they have banned fishing! Radiation contamination must be really bad there, but it cannot be as bad as in Japan, so we are made to eat highly contaminated fish that are caught and sold freely in Japan! And on and on and on. After having seen the retweet on this "news" today for nth time, I finally happened on the source material, the video by RT. Here's the screen shot that has freaked the Japanese and spawned endless tweets and retweets on radiation contamination scare and speculations about compensation money that will be demanded by the US: "No fishing" sign at a port. "This summer California fishermen are ready to inspect their catch closer than ever before." "The word "radiation" creates a fear in people." Uh.. yes, so? The fisherman may as well be answering to the reporter's question, "So tell me, what do you think of when you hear the word "radiation"?" From this, many in Japan have connected the dots - fish in California are contaminated with radioactive materials from Fukushima, and they have banned fishing because of that, and see, the fisherman is afraid, and the US government will demand compensation from Japan! In the 2 minutes and 50 seconds news clip, RT shows photographs of damages from last year's earthquake/tsunami/nuclear accident, then the soundbites from the US media when they reported back in May on the Stanford researchers' findings of small amount of radioactive cesium in bluefin tuna off the coast of California (10 Bq/kg or so, or about 5 times the background) last year. As far as my quick search goes, "L.B.M. 16.08.460" is one of the sections in the Long Beach Municipal Code, and it is about fishing restrictions. The section has been there in the Code, it has been amended numerous times (here is one of them, here's another). The sign that RT used in the background of the news report is probably the sign to tell recreational anglers that they cannot fish at that location. Almost 17 months since the start of the nuclear accident, we are no wiser. Just like this sometimes-cynical old-timer (I presume; at least he doesn't seem to be in the same generation as the organizers of the Friday protest) has astutely predicted, former Prime Minister Naoto Kan had already coordinated with current Prime Minister Yoshihiko Noda so that PM Noda would meet with these young organizers as representatives of anti-nuclear movement, even before Mr. Kan met with the organizers on July 31. Now, Asahi Shinbun says PM Noda will be happy to meet with the organizers on Friday August 3. Oops. The government is moving in quickly. The meeting was supposed to be sometime next week. Prime Minister Yoshihiko Noda has decided to meet with the members of the citizens' group who has been calling for a protest every Friday at the Prime Minister's Official Residence against the restart of KEPCO Ooi Nuclear Power Plant (Ooi-cho, Fukui Prefecture). The coordination is under way to set up the meeting on August 3, the day when the next protest is planned. Prime Minister Noda will meet with the representatives of "Metropolitan Coalition Against Nukes", which is made up of 13 different citizens' groups and individuals. So far, the prime minister has declined to meet with the protesters, saying there is no precedent to do so. He has so far declined the request for a meeting through the bi-partisan group of politicians called "Zero Nuke Plant". However, as the protest is growing bigger in size and there is criticism within his administration that [PM Noda is] not taking people's wishes seriously, Mr. Noda has had a change of heart. However, the prime minister has no intention of reconsidering the restart of Ooi Nuclear Power Plant, and he is expected to ask for understanding of the government's energy policy review. Stop all nuclear power plants immediately and decommission them. Scrap all the new constructions of nuclear reactors and plants immediately. Withdraw immediately from nuclear fuel recycling business immediately. Scrap the appointment of the members for the Nuclear Regulatory Commission. Help the victims of the nuclear accident. Make people accountable for the accident. Improve the work condition of the plant workers. Remove excessive police presence in the protests at PM's Official Residence. There are many tweets praising the organizers for this "achievement" of securing a meeting with the nation's prime minister. The government has been holding this sham of public meetings in 20 locations in Japan to "hear" from citizens what the government should do with its long-term energy policy. It's the one planned and organized and analyzed by one of the biggest PR and ad agencies in Japan, and the politicians attend the meeting as if they are just props. The government was accused of letting the employees of electric power companies (nuclear plant operators) speak at the meetings. The most recent one was held in Fukushima City, and almost all the citizens who were allowed to speak said "zero nuke". To be expected, Yomiuri Shinbun ignores the news, Asahi Shinbun reports but with no mention that almost all of the citizens were against having any nuclear power plant. Nikkei Shinbun, Kyodo News, and a host of local papers quoting Kyodo News report it (if you read Japanese, here's a link to see for yourself). And Reuters reports it. (Reuters) - Get out of nuclear power and do it fast, angry Fukushima residents told Japanese government officials on Wednesday at a public hearing on energy policy held in an area ravaged by a nuclear disaster that has whipped up opposition to atomic power. The Fukushima hearing, the ninth out of 11 planned nationwide, sought to gather views on nuclear power's role in the nation's energy mix as the government struggles to cover a power shortfall by that could threaten economic growth. Meltdowns at Tokyo Electric Power Co.'s Fukushima nuclear plant after an earthquake and tsunami on March 11 last year caused radiation to spew over large areas of Fukushima, forcing more than 160,0000 people to flee. In the following months, all of Japan's nuclear plants were shut for safety checks. Two reactors resumed operations last month. "I want all the reactors in Japan shut immediately and scrapped," a grey-haired woman, who introduced herself as a farmer living 65 km (40 miles) from the Fukushima plant, said at the public hearing in the prefecture capital. "Many people are now aware that the government's talking of 'no immediate risk to health' is tantamount to 'long-term health risk'," she said to the applause of about 200 residents packed in a small concert hall. Goshi Hosono, minister in charge of the response to the nuclear crisis, was heckled as he apologized for the suffering of people in Fukushima. "I will never forget what I heard today, and I'm determined to do everything I can," he said. Fukushima prosecutors on Wednesday launched an investigation after more than 1,000 residents filed criminal complaints against 15 former and present Tokyo Electric Power officials, including former company president Masataka Shimizu, and 18 government officials, including Nuclear Safety Commission head Haruki Madarame, a lawyer for the group, Hiroyuki Kawai, told Reuters. Kawai said Tokyo prosecutors had launched a separate investigation. A panel of experts appointed by parliament concluded last month that the disaster could have been prevented and that failure to take precautions was the result of "collusion" among the utility, regulators and the government. "After reading the report by the parliament-appointed panel, prosecutors could not stand idly by," Kawai said. Japan met about a third of its energy needs with nuclear power before the disaster and had plans to boost that share to more than half, in part, to combat global warming. Now, three options that the government has put on the table are to phase out nuclear power completely as soon as possible, aim for a 15 percent share of the power supply by 2030, or a 20-25 percent share by the same date. Residents of Fukushima, 240 km (150 miles) north of Tokyo, overwhelmingly backed the zero option, with all but one of the 30 who were picked in a draw to speak backing a swift exit. The Asahi newspaper reported this week that elsewhere 70 percent of those taking part in the hearings opted for the nuclear-free scenario. It is not clear how the hearings will affect the final energy plan that could come as soon as this month. But commentators said it would be hard for the government to ignore the findings as 17 months after the world's worst nuclear accident since Chernobyl, many still live in fear and thousands hired to dismantle the Fukushima plant face decades of grueling and dangerous work. Prime Minister Yoshihiko Noda's decision to restart two reactors in Japan's western manufacturing hub to avoid blackouts galvanized the anti-nuclear movement. More than 100,000 people attended an anti-nuclear rally last month and protests staged weekly outside of Noda's residence have grown, with ordinary workers and mothers with children joining the crowds. "I'm scared. I'm really scared," said a middle-aged woman, addressing the hearing. "I'd like the government to think about why people have gathered in front of the prime minister's residence every Friday since April. That's not fashion. That's not a temporary fever. That's a heartfelt scream from the public." "But commentators said it would be hard for the government to ignore the findings as 17 months after the world's worst nuclear accident since Chernobyl"? Who are these commentators? Do they think Japan is a democracy or something? Reuters clearly doesn't know about the ad agency managing this whole event. so that they would be placed in favorable slots in the tournament. It seems China started it (it has been accused of the same tactics over the years) so that the final would be "China vs China". Seeing China doing it, South Korea and Indonesia followed. The audience booed and jeered, and the players were disqualified by the Badminton World Federation and thrown out of the Olympics. They tried to lose to win. And now they have been thrown out of the Olympics. It was a stunt so glaring, so obvious that the crowds jeered and the referees tried to intervene. It began when Chinese top seeded women Wang Xiaoli and Yu Yang starting serving into the net and missed easy volleys. Already guaranteed a slot in the next round, they want to let South Koreans Jung Kyung-eun and Kim Ha-na finish at the top of Group A so they could avoid playing Chinese compatriots and second seeds Tian Qingand Zhao Yunlei at least until the final. If the strategy worked China could win gold and silver. The South Koreans realized what was happening and responded by copying the antics of the Chinese pair. That prompted the referee to stop play and warn all players. But play resumed, the match ending unusually quickly with the Koreans winning. But it did not end there. The other South Korean pair, third seeds Ha Jung-eun and Kim Min-jung, tried to orchestrate defeat in their game against Indonesia's Meiliana Jauhari and Greysia Polii. They seemed to be trying to avoid Yu and Wang in the quarter-finals. It gets worse. The Indonesians, spotting the shenanigans, tried to play along and lose too. The crowd was incensed. As were the TV commentators. ... It did not take long for Badminton World Federation to respond. This morning the eight players were kicked out the Olympic games, accused of "not using one's best efforts to win" and "conducting oneself in a manner that is clearly abusive or detrimental to the sport." All four pairs were accused of wanting to lose in an attempt to manipulate the draw for the knockout stage. Speaking before the verdict, Korea's coach Sung Han-kook said: "The Chinese started this. They did it first. It's a complicated thing with the draws. They didn't want to meet each other in the semi-final, they don't want that to happen…. They (BWF) should do something about that." Now, I have a slight anxiety over the Japan's women's soccer team. It has advanced to the quarter final with one win and 2 draws in the qualifying round, but the team's general manager is on record saying he wanted his team to draw so that the team would advance to the quarter final as the No.2 in the qualifying round, instead of No.1. The reason? He wanted his team to stay where they were (Cardiff), so that the players wouldn't get tired from traveling to a different city (Glasgow; they would have had to, had they been the No.1). In the last qualifying match with South Africa, the Japanese team had 2nd and 3rd string players so that the top players could rest, supposedly. The general manager says he decided to shoot for a draw and told his players so in the second half of the match. Because there is always the "next month"! Hope springs eternal in the algo bots' mind (which went haywire earlier today). The stock markets in the world are dead, as a price and value discovery mechanism. They have been, particularly since Helicopter Ben and Mighty Hank (Paulson, then-Treasury Secretary) pulled off a stunt in the summer/fall of 2008 to directly and openly intervene with the financial markets. The only noticeable drop is seen in gold (down nearly 1%), with the reasoning that "since the central bank won't inflate anytime soon, risk is off!" The problem with that of course is that the riskiest and fluffiest class of asset (equities) which has defied the gravity remains unchanged. Risk off? What risk off? The Federal Reserve says the economy is losing strength and repeated a pledge to take further steps if the job market doesn't show sustained improvement. The Fed took no new action after its two-day policy meeting. But it acknowledged that economic activity had slowed over the first half of the year, unemployment remains elevated and consumer spending has weakened. Policymakers repeated their plan to hold short-term interest rates at record low levels until at least late 2014. Most economists say the Fed is likely to go further at its September meeting by launching another bond-buying program to drive down long-term interest rates. The statement was approved on an 11-1 vote. Jeffrey Lacker, president of the Federal Reserve Bank of Richmond, dissented for a fifth time this year. Hardly anyone seems to pay serious attention to Fukushima I Nuclear Power Plant itself these days, except occasional, perfunctory mentions of how radioactive materials are still spewing from the reactors and how the groundwater is being contaminated because the basements are leaking (almost always without citing the actual numbers). All the talk about imminent collapse of Reactor 4 has all but died down, and no sensational stories about the plant are circulating on Japanese Twitter. So what is TEPCO, now officially the government company with the capital infusion of 1 trillion yen (US$12.8 billion), doing these days at the plant? Very prosaic, mundane jobs like picking up concrete debris to save for later testing, trying to unclog the pipe to insert a thermocouple, hosing down the fuel assembly. They have been also building the multi-nuclide absorption towers (Toshiba), trying to replace Kanaflex hose for the transport of contaminated water, trying to clean the subdrain pit water, and asking workers from affiliate companies how they are doing. This post is the first installment from the monthly report, about the workers picking bits of concrete rubble near the blown-up reactors at Fukushima I Nuke Plant. In the report, it is the last item, but it stuck with me as I browsed through the report yesterday while listening to the press conference given by Naoto Kan and his "Zero Nuke" group of politicians. The workers got 0.3 millisievert radiation exposure for one-hour work of picking up concrete bits, and the concrete bits are not very "radioactive" in Fuku-I standard (it would be considered extremely high outside the plant), at 2,000 microsieverts/hour (or 2 millisieverts/hour). Where is that former Prime Minister who supposedly scolded top executives at TEPCO and urged them to go to Fukushima I Nuke Plant, saying he himself would go with them? Why isn't he picking up the pieces of radioactive rubble, instead of the workers who may be paid only 8,000 yen (US$102) per day for their work? The former Prime Minister Naoto Kan was busy trying to re-invent himself as champion of "ordinary citizens" who are against nuclear power plants and as key man who can connect these citizens with the power that be (Prime Minister Noda and his high-ranking ministers like Mr. Edano), when he and his supposedly anti-nuclear group of politicians held a press conference and the closed meeting with those "citizens" on July 31. But that will be another post. The crowd doesn't look as big as some of the past Friday protests at the Prime Minister's Official Residence. Calling it "200,000" like the organizers did is probably a stretch, but so is the call by AP of "thousands". Reuters' "tens of thousands" may be just about right. But who knows. I wasn't there to feel the size, so what am I to say? These aerial photographs were taken by "正しい報道ヘリの会" (proper reporting helicopter's group). DPJ's leadership election is scheduled on September 21, and Yoshihiko Noda is expected to win. This friendly discussion meeting between the organizers and politicians is closed to the public, but Iwakami's IWJ and Nico Nico will do the live netcast for the rest of us from 5PM on July 31, according the organizers. Whenever I look at the photos and videos of the Friday protests or any other local protests, what I see is the old timers - people in their 50s, 60s, 70s who do not want to leave the country like it is now to their children and grandchildren. Incidentally, AC/DC music was among "the loud music played to detainees at the Guantanamo Bay prison facility in preparation for interrogations", as the article below notes. July 25 (Bloomberg) -- Iran’s nuclear facilities have suffered a cyber attack that shut down computers and played music from the rock band AC/DC, the F-Secure Security Labs website said. A new worm targeted Iran’s nuclear program, closing down the “automation network” at the Natanz and Fordo facilities, the Internet security site reported, citing an e-mail it said was sent by a scientist inside Iran’s Atomic Energy Organization. The virus also prompted several of the computers on site to play the song “Thunderstruck” by AC/DC at full volume in the middle of the night, according to the e-mail, part of which is published in English on the website. F-Secure Security Labs, which is linked to F-Secure Oyj, the Finnish maker of security and cloud software, said that while it was unable to verify the details of the attack described, it had confirmed that the scientist who reported them was sending and receiving the e-mails from within Iran’s Atomic Energy Organization. Iran’s nuclear program and oil facilities have been subject to a succession of cyber attacks that the Foreign Ministry said in May were launched by hostile governments as part of a broader “soft war.” Iran accuses the U.S. and Israel of trying to sabotage its technological progress. Both countries say Iran’s nuclear activities may have military intent, an allegation that Iran denies. Iran has called on the United Nations to condemn organized cyber attacks against nations, the head of Iran’s Information Technology Organization Ali Hakim Javadi said today, according to a report by the state-run news channel Press TV. Significant investment is needed for the creation of malware viruses such as Stuxnet or Flame, which previously targeted Iran, indicating that they were not produced by individuals, the Iranian official said. AC/DC have played “high voltage rock ’n’ roll” since they were formed in 1973 in Australia, according to the band’s website. Their songs were among the loud music played to detainees at the Guantanamo Bay prison facility in preparation for interrogations, the Associated Press reported in October 20009, citing the National Security Archive in Washington. F-Secure Security Labs is involved in analyzing viruses, spyware and spam attacks, according to its website. TEPCO says "His life is not in danger." Judging from the past 16 months of communication by TEPCO and the Japanese government (who are one and the same at this point, after the effective takeover of TEPCO by the government), it may simply mean "not in immediate danger", and by "immediate" it means "instantaneously". TEPCO announced the news 4 days after it happened. TEPCO announced on July 30 that Masao Yoshida (age 57), former plant manager of Fukushima I Nuclear Power plant, complained of feeling ill on the evening of July 26 when he was away from home, and that he underwent an emergency operation for cerebral hemorrhage at the hospital he was brought to. The operation was successful, and he is conscious even though he is still in grave condition. TEPCO says his life is not in danger. Since the start of the nuclear accident on March 11 last year, Mr. Yoshida led his team of workers to deal with the accident as the plant manager. He was diagnosed with esophagus cancer and hospitalized in November last year. He resigned as the plant manager at the end of November and has been receiving medical treatment at home. TEPCO's Junichi Matsumoto didn't explain the details of when Yoshida suffered cerebral hemorrhage, saying it was his family's wish. According to the doctor [at the hospital?] there is no direct relationship between the cerebral hemorrhage and the esophagus cancer. TEPCO announced in December last year that Mr. Yoshida's radiation exposure level after the start of the nuclear accident was about 70 millisieverts. The latent period for esophagus cancer is between 5 to 10 years. At the time of the announcement, TEPCO quoted Dr. Makoto Akashi, Executive Director at National Institute of Radiological Sciences, who said the possibility was extremely low that [Yoshida's esophagus cancer] was caused by radiation exposure. Liar, liar, pants on fire! The Noda administration has successfully pass the legislation to increase Japan's sales tax from current 5% to 8% (then to 10%) with the help of the opposition parties, and the ostensible reason was to "reform and improve the public safety net". It was BS as it stood, because the money will be taken from the very people Prime Minister Noda says he wants to help. Now, according to Tokyo Shinbun, the administration has much better use of the money that they will have: public works. Ah. Good old trusty public works that have never succeeded in lifting Japan from the two-decade-long economic stagnation (dubbed "Lost Decades") but have helped in keeping the biggest general contractors in business. Let's raise sales tax, everybody pays this tax for everything they buy. Lots of money will fill the government coffer. No need to issue government bond to pay for the social services any more! Let's spend that "money" on public works! Only in the last bastion of John Maynard Keynes. A curious discussion has been going on in the Upper House special committee on the simultaneous reform on social security and taxation. The main topic of the discussion is whether to use the extra breathing space from the sales tax hike in public works. All of the money from the tax increase is supposed to be used in providing social security. But if we listen to the discussion, it is almost like "simultaneous reform on taxation and public works". In the committee meeting, the Councilors from Democratic Party of Japan (DPJ), Liberal Democratic Party (LDP) and Komei Party keep repeating, "We should increase the budget for public works because the public works protect the life and living of the citizens." The basis of their argument is the revised regulation that the three parties agreed on in June, "Addendum 18 Item 2". It says, "Considering the effect of the sales tax hike on the economy, the fund will be specifically allocated to the growth strategy and areas like disaster prevention and disaster mitigation." If the sales tax is raised to 10% and additional 13.5 trillion yen is in the government coffer, that will decrease the amount of government debt to pay for the social security. So why not use this extra spending power [what's "extra" about this?] in public works for disaster prevention and such? That seems to be their thinking. Prime Minister Yoshihiko Noda is sympathetic to the idea, saying "If the economy grows and tax revenue rises, disaster prevention and disaster mitigation will be the priority for added funds." The government has been explaining that the purpose of sales tax hike is to achieve both the reform on social security and the fiscal reform simultaneously. Money is fungible, but if the money from the tax hike is diverted to public works, the fiscal reform will be delayed, and additional tax hike may become necessary. What is the point of the sales tax hike then? The point of raising sales tax is, because they can, and they want to look good in the eyes of IMF. And because the citizens have long been pushovers (and the foreign residents have no say). If the economy grows? PM Noda expects the economy to grow by raising tax for the constituency that has no power - individual taxpayers. Japan's large exporters will benefit from the sales tax hike, and they will receive extra credits. I suppose Mr. Noda is not counting on the Japanese citizens and residents to spend money to expand the economy. Secondary coolant leak alarm was sounded on July 30, but the workers didn't find any actual leak. 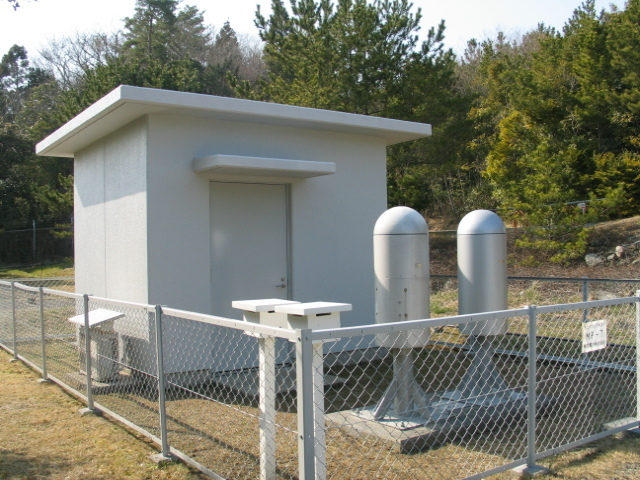 Or so the Japan Atomic Energy Agency, the operator of Monju Fast Breeder in Fukui Prefecture, says. Japan Atomic Energy Agency (JAEA) announced on July 30 that an alarm was sounded off at about 3:40AM on July 30 that signaled a leak of coolant (liquid sodium) from the secondary cooling system at Monju Fast Breeder Reactor (Tsuruga City, Fukui Prefecture). It is not known why an alarm was triggered. JAEA will investigate, and will report the findings to the Nuclear and Industrial Safety Agency under the Ministry of Economy, Trade and Industry. Monju Reactor is stopped, but the nuclear fuel is loaded in the reactor. To cool the fuel, liquid sodium is being used in the primary and secondary cooling systems. The alarm was set off by one of the detectors placed around the secondary cooling system pipes in the reactor auxiliary building. The workers went to the site to do the visual inspection, but no sodium leak was observed, says JAEA. (UPDATE) AP's reporter sent me a tweet saying "Even though the opening says "thousands", "10,000" is mentioned in the article and even the event with 200,000 people is mentioned in the article." Yes they are, and that's what I quoted below. I'm asking her why the opening was "thousands". TOKYO (AP) — Thousands of people formed "a human chain" around Japan's parliament complex Sunday to demand the government abandon nuclear power — the latest in a series of peaceful demonstrations on a scale not seen in the nation for decades. Similar demonstrations have been held outside the prime minister's residence every Friday evening. The crowds have not dwindled, as people get the word out through Twitter and other online networking. A July 16 holiday rally at a Tokyo park, featuring a rock star and a Nobel laureate, drew nearly 200,000 people. The crowd appeared to be smaller Sunday. Kyodo News service estimated it at about 10,000 people. Participants said they came from across Japan, underlining the widespread appeal of the protests. TOKYO (Reuters) - Tens of thousands of people protested against nuclear power outside Japan's parliament on Sunday, the same day a proponent of using renewable energy to replace nuclear following the Fukushima disaster was defeated in a local election. The protesters, including old-age pensioners, pressed up against a wall of steel thrown up around the parliament building shouting, "We don't need nuclear power" and other slogans. On the main avenue leading to the assembly, the crowd broke through the barriers and spilled onto the streets, forcing the police to bring in reinforcements and deploy armored buses to buttress the main parliament gate. The Metropolitan Police says (remember, there is no "official" number form the police on any demonstration) "ten and several thousands", according to Mainichi. TBS says "15,000", quoting their police source. The organizers, who discouraged people from showing up on Friday to concentrate on the July 29 event, says "200,000". One of the organizers tweeted that she was going to focus on media handling (giving interviews) at the event, but did see the actual protest. She was also tweeting about the Friday protest that she and her friends disapproved of, saying the number of 2,800 was "just about right", to which others responded by saying that was just too low. The July 29 protest did produce two arrests. As Reuters and TBS News note, the protesters had a scuffle with the riot police when people flooded the streets, and two protesters were arrested for obstructing the police in the performance of their duties. Interestingly, unlike the previous protests at the PM Official Residence on Fridays, BBC and NPR (National Public Radio in the US) have been reporting this particular protest repeatedly. I wonder if someone has gotten smarter and is contacting the foreign media to prompt better coverage. after defeating Morocco 1 - nil. The single goal of the game was made by Kensuke Nagai with only six minutes left on the clock. With the 1 - nil win over Spain, Japan will now advance to the quarter final (tournament), regardless of the result of the final match in the qualifying round with Honduras on August 1. Some woman is speaking with rough words. Looks hot, looks like a lot of people. Now some group of women is about to sing some songs. Elliott Wave Update ~ 24 April 2019 - Market keeps pushing for a new high which is the primary count overall and has been for quite some time. How it gets there is the question.